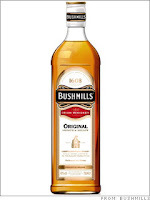 Bushmills Malt 10 notes are here. Smells of white chocolate and toffee, thick and insistent. Sweet and creamy on the palate, with a dry, bittersweet finish. This feels like Bushmills Malt 10, except sweeter and softer. I think that's a good thing. And at this price, it's tough to beat! The Black Bush is fully aged in Oloroso Sherry casks, and, as you well know, I'm a total sherry freak when it comes to whiskey. You can see the sherry in this dram right off the bat, in its characteristic deep russet color. It's very evident in the nose, as well, sweet and spiritous. 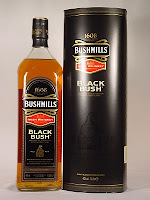 Like its non-sherried cousin, it's nice and creamy, but the Black Bush has a bit of cinnamon in its long, dry finish. Like the Original above, I think it's a fairly uncomplicated whiskey -- or is it just my mood? -- but I like it very much, indeed, to the great surprise of no one at all. Happy St. Patrick's Day, everyone! And on that note, Guinness is lobbying to make this a national holiday in the U.S. Why not sign the petition to make it happen? The country -- and, indeed, the world -- could use a few more simple, easy-going holidays like this one could be. Grant's Family Reserve is interesting. It's one of those blends that spring to mind when a working-class fellow who's been around the block mentions "Scotch." Cheap, ubiquitous. A man's drink. But, upon tasting it, I'm once again reminded that none of that means it's not good. I sat down with this one some time ago and compared it directly, head-to-head, with the Grouse. The two are very similar. The Grant's nose seems slightly sweeter, with an appetizing hint of banana. The taste is sharper, though not unpleasant, and the finish longer. By my reckoning, the Grouse beats this one out, but not by much. If I were on a budget, however, I'd probably prefer Grant's; at 13 USD for a 750 mL bottle, or somewhere around 20 USD for a 1.75 L bottle, the price is hard to beat. I'll also note that Grant's has a sherry cask offering, finished in ex-Oloroso casks, for the same price. Sherry freak that I am, it seems right up my alley. So many whiskies, so little time!